Fancy getting married in a field?! Your friends and family may think you are crazy, but show them these amazing Tipi Wedding venues and they will completely understand your new found Tipi obsession. Tipi weddings have grown in popularity and this demand has lead to an increase in fantastic Tipi suppliers and venues offering to host Tipi weddings. Tipis, Marquees, and Yurts come in all shapes and sizes so getting a good idea of how many people will be on your guest list is crucial when picking your canvas. 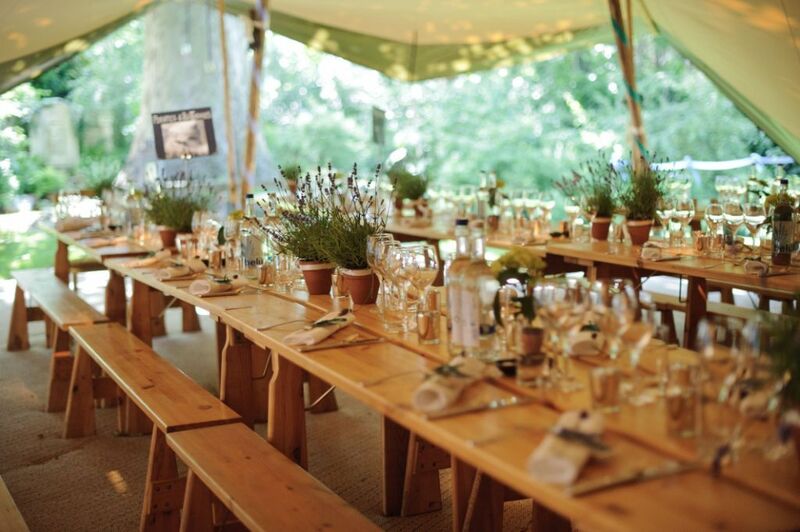 Tipis interconnect and each have their own capacities, so have a think about what other event spaces you’d like to include. It’s time to get creative. Maybe you need an extra area for dancing, space for a band, cake display, or a laid walkway. All are possible when you can build your own venue. Now you have guest numbers and your Tipi wish-list, suppliers will be happy to advise on size, style and set up, along with the costs involved. Take a look at our supplier list of Tipis, Marquees and Yurts for contacts and style inspiration. Suppliers such as Cotswold Tipis can offer the full package, from basic Tipi hire to full support, sourcing the best suppliers and ensuring your wedding runs smoothly. Now you know your Tipi size and style, you can start looking at suitable land to host your day. First you need to tick off the set-up basics: The tent provider will be looking for a large enough area for the Tipis as well as space to pull the canvas over. They will need good access into the field, and the land owner will be able to advise if there are any overhead or underground services to be aware of. Also the land should be relativity flat. All suppliers will have a list of places they have used previously and recommend, but there’s plenty of scope to think outside of the box when it comes to location. You may have your dream plot in mind, but if not, take a peek at our ‘Land’ section on findyourperfectvenue.com. You can also search for venues ‘With a view’ for venue listings which include farmland, barns, and castles. with beautiful vistas. Many existing wedding venues, such as country houses, hotels and estates, have plenty of ground to play with, and you can take advantage of the facilities inside. There may even be guest rooms on site. It’s not a problem if your land doesn’t have power or toilets as your Tipi supplier can hire a generator and luxury toilet block in for you, although this will need to be added into your budget. Styling a large Tipi doesn’t have to be as daunting as it sounds! Wedding Stylist, The Little Wedding Helper has a beautiful Tipi Styling Pinterest Board you can get completely lost in. And, if you have some ideas but don’t know where to start you can always enlist in the help of a wedding stylist to bring your Pinterest dreams into reality. With a Tipi Wedding you can really get a sense of the outdoors being brought in. They strike a perfect balance between elegance and a romantic wild feel, and the result is one that you and your guests will absolutely love.